Maison Close is not a new project/ album, rather is a ten year anniversary repress which has been reissued in much the same presentation and content as the original release. 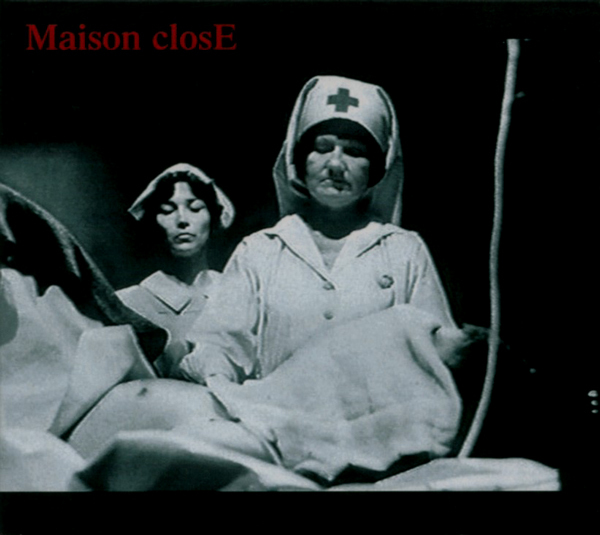 Regarding its genre Maison Close could be described as something like noise infused dark ambience, which verges on a windswept power electronics sound. As such the sonic palette consists of sustained analogue drones, sweeping ominous textures and slow grinding loops which evokes a partial linage to the early Loki Foundation heavy electronics style – think Predominance, Dagda Mor, Ex.Order and early Inade. The overall atmosphere generated by the heavy use of dialogue samples is also reminiscent of what Propergol would later do with the same concept, yet Maison Close generates a more consistent soundtrack type atmosphere due to the singular source which the movie dialogue is sampled from. Regarding its usage of sampled dialogue, thematically the album focuses on the 1971’s motion picture ‘Johnny Got His Gun’ which makes for great conceptual fodder. Although the movie is in effect an anti war tome told from the perspective of an severely wounded soldier, here Maison Close have focused on aspects which address the existential fear of being mentally cognisant, but trapped in a comatose and non-responsible body with the following panic and terror which would ensue. Noting the albums visuals have also been lifted from the movie, the album very much plays out as an alternate experimental soundtrack to the source material. Noting the calmer arc of the first half, things step up on mid album track ‘Tom-nihil-rec’ that contains the first use of prominent vocals, presented in an agonised power electronics style that soar above the sonic undercurrent of grinding and crumbling noise. The track ‘Pain’ also utilised prominent vocals, which achieves an agonizing climax with its combination of swelling distortion and deranged vocal delivery. ‘Interferences’ mines a similar vein to Brighter Death Now’s death ambient sound, which here combines a cavernous echo chamber ambience with a prominent singular mid range piecing tone that burrows deep into your psyche and making this track anything but easy listening. A heavy noise squall and agonised vocals then reappear on ‘Eclats de vie’ before one final section of sampled movie dialogue to conclude the album (“SOS help me… SOS help me…” repeated…). Given where others have taken this sort of sound in the years following the original release, I would not necessarily call this classic or ground-breaking. Yet it is still a solid album all the same which had successfully merged its overall tone and atmosphere with its conceptual context. This entry was posted in 2012, dark ambient, Force Majeure, heavy electronics, power electronics by noisereceptor. Bookmark the permalink.